Tonight on ABC DANCING WITH THE STARS ALL-STARS, the seven remaining couples pay homage to Veterans Day with a night of meaningful performances. The remaining couple will face two eliminations this week. On last week’s show the remaining seven couples faced a fusion routine to try to outlast one another as they competed in this season’s dance marathon. The remaining couple faced no elimination last week. Did you watch last week’s performance show? We did and we recapped it here for you! Tonight’s show will include two rounds of competition for the seven remaining couples, a Ballroom and Latin Trio round. In honor of Veterans Day, the first round will feature performances to songs that pay homage to servicemen and women. During the Latin Trio round, each couple will be joined by an eliminated pro or Troupe dancer. The audience will also be joined by members of several branches of the Armed Forces, including two former Marines, William Franco Vasquez and Nick Jones Jr., who will be special guests on an episode of ABC’s hit comedy “The Middle” on November 14. Tomorrow night’s “Dancing with the Stars: All-Stars the Results Show” will feature outstanding musical performances from Kylie Minogue and Ne-Yo. Global pop icon Minogue will perform “Locomotion” alongside the renowned “DWTS” band, accompanied by pro dancers Kym Johnson and Tristan MacManus. Tonight’s episode is going to have all the usual glitz and glam in the ballroom, which you won’t want to miss. So be sure to tune in for our live coverage of ABC’s Dancing With The Stars All-Stars Week 8 Performance Show – tonight at 8PM EST! 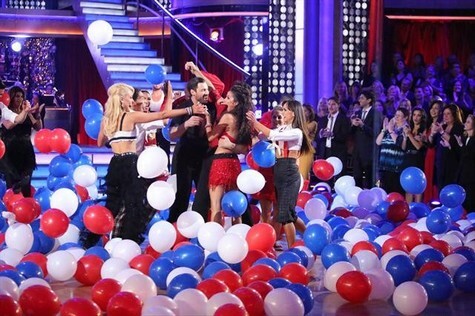 While you wait for our recap, hit the comments and let us know what you thought of last week’s episode of Dancing With The Stars All-Stars. LATIN ROUND – TRIO DANCE! Len: “I can only judge it as I saw it. You exposed yourself, you did not hide behind the professionals, it was full on, well done! THE END – Join us tomorrow to see who the 2 couples eliminated are!! !